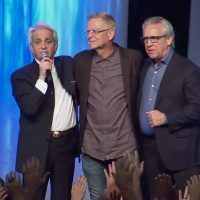 EW has produced a video of a Voice of The Apostles conference that was held Oct. 17-20 in Lancaster, PA. Watch the video and you will witness what happens when NAR wolves lay their hands on people. It’s not a pretty sight. Is the Holy Spirit really responsible for this sort of bizarre behavior? No. Why? Because it doesn’t glorify God. This event is where top false prophets of the NAR ordain and “anoint” their disciples. The EmergentWatch documentary video is a composite of over 8 hours of video taken during the 3 day event. In this video one can witness the demonic transference from these false “apostles”, and the demonic spiritual effect this has on their followers. These effects have been compared to those seen in occultic Kundalini awakening and the uncontrollable movements known as “Kriyas”.